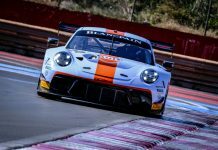 The 2015 season of the Blancpain GT Series has started with the first day of official testing at the Circuit Paul Ricard in the South of France. The teams fielded a total of 45 GT3 cars and used the 5,79 km version of the Le Castellet track to perform an extensive shakedown of their machines. At 9am sharp, the #30 BMW Z4 of Series newcomer Classic & Modern Racing was the first to leave the pitlane, quickly followed by the #888 BMW of Triple Eight Racing. In those overcast morning hours temperatures barely went above the 10°C mark, creating ideal conditions for quick lap times. 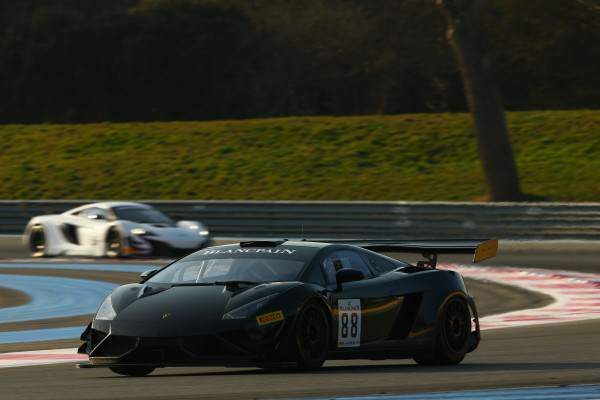 At the end of the first half of this opening day, it was the #88 Reiter Engineering Lamborghini Gallardo LP 560-4 R-EX topping the time sheets, beating the competition by over a second. During the warmer afternoon session – once the cloud cover broke, air temperature swiftly got past the 18°C – lap times went up as well. The #11 Kessel Racing Ferrari did manage to improve however, finishing a largely incident-free day in second, behind the Lamborghini. Lap times were not the priority during this first day of testing however. 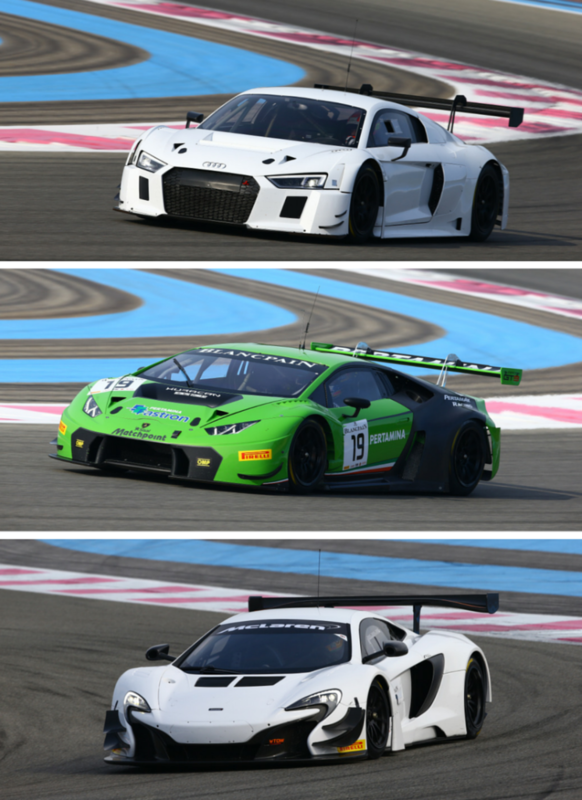 Most teams, drivers and fans were eager to see some of the new GT3 cars for the 2015 season in action. 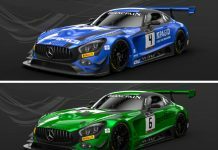 The cars that took the largest part of that attention were the new Lamborghini Huracan of Grasser Racing Team and the McLaren 650S of Von Ryan Racing, both making a first time appearance in an official Blancpain GT session. 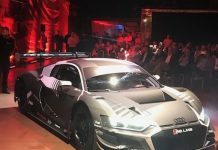 There was a pleasant surprise in the form of the unannounced and new Audi R8 LMS ultra. The striking white machine will participate in its first Blancpain GT Series race during the course of the season. The second and final day of the official test days for the Blancpain GT Series has started at 09.00am, with a couple of drivers and teams who did not come into action today. 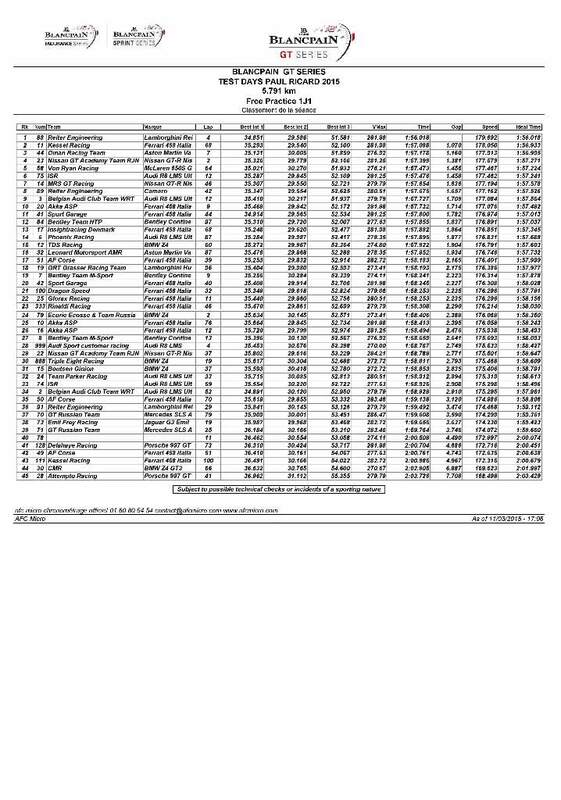 Next articleELMS: Silverstone Entry List Released – 35 Cars!